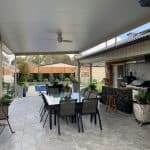 When you are deciding on the roofing for your patio, pergola, deck or alfresco, it is important to choose the type of roofing that’s going to best suit your home, and how you use your outdoor area. Obviously, you want to protect what’s underneath your roof from the cold frosts and rain in Winter and the hot sun of Summer. Therefore your roofing needs to be good quality and installed professionally to provide the right cover for you and your home. There are a variety of roofing options you can choose. Here are four of our favourites. 1. Louvre roofs – our most popular! One of our favourite types of roof is the louvred roof. And it comes with various options that can be designed to provide the type of cover you want. We can work with you to design a roof that integrates with your home seamlessly, allowing you to climate control the sun as you need. The Project of the Month features a louvre roof. 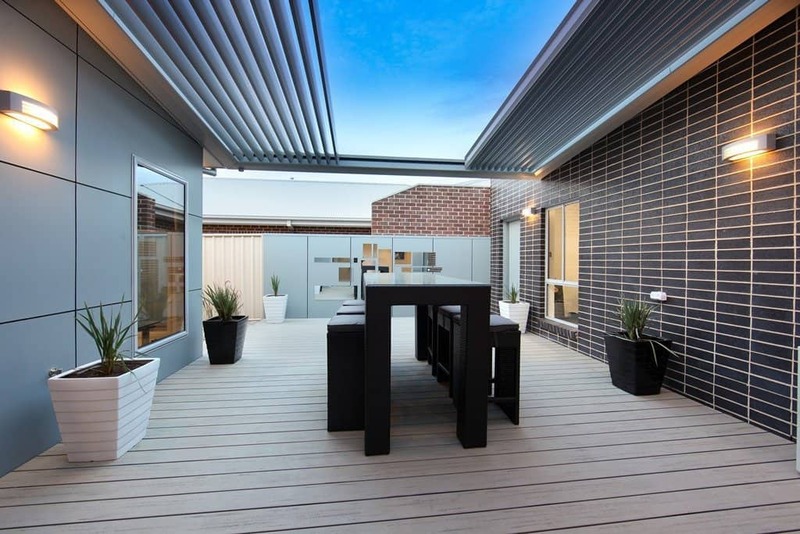 Retractable roofs ensure you can get the most out of your alfresco area. 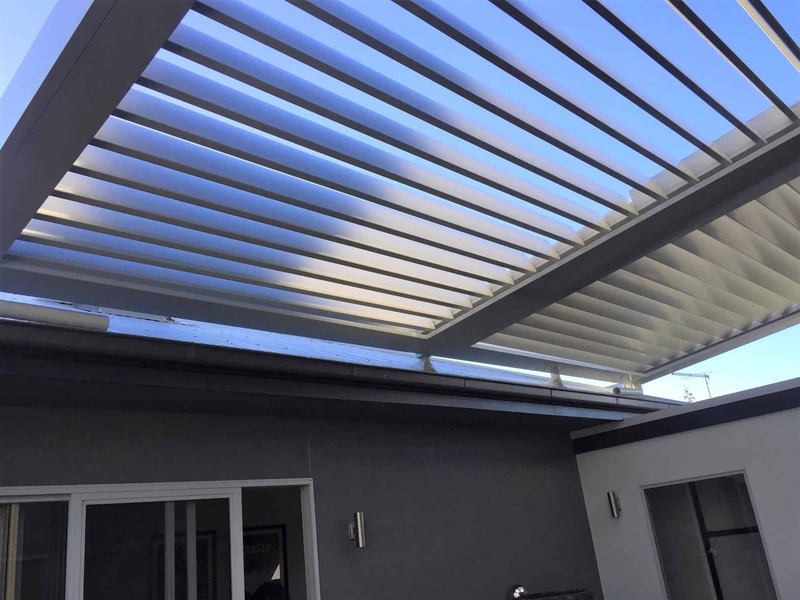 They offer not just the flexibility of opening or closing the louvres, but also the functionality of opening the whole sky to your outdoor area. With the technology to slide the entire roof open to one side, the sky really is the limit – with an uninterrupted view. What that means for you is even more versatility to suit the weather conditions. So when the sun is shining on a winter’s day, simply slide the complete roof open and enjoy the blue skies and joyous winter weather. A popular option in alfresco design to help create an indoor-outdoor feeling and help manage temperatures are insulated ceilings. 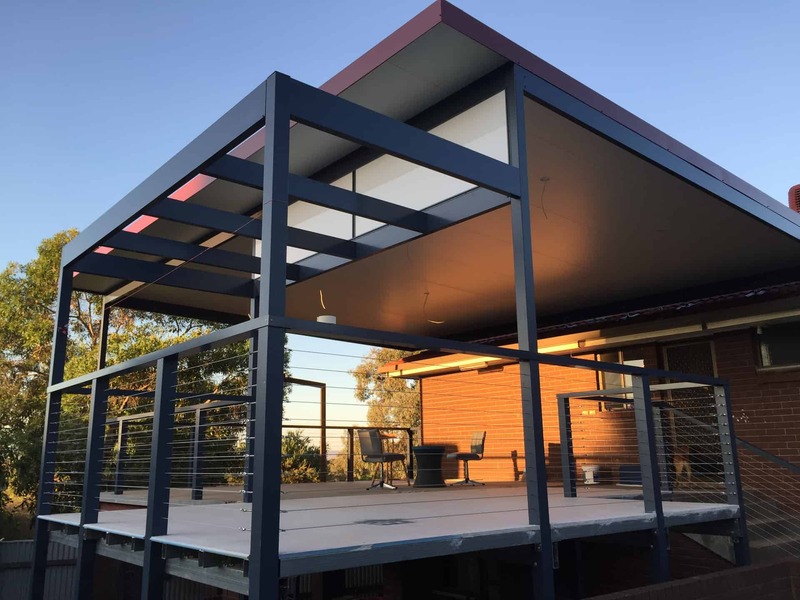 If you want your alfresco to feel like it is part of your home and create a natural flow from your indoor space to outdoors, having an insulated ceiling can help achieve that. Read more about insulated panels here. 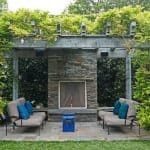 An open arbour can provide shelter, or shade, and serve as an accent to your home. It can blend in with the landscape or be a focus point. Usually, the walls and roof consist of open framework, and they are great for growing vines over creating shade in Summer and allowing the sun through in Winter. Tiles or any other product to match with existing. A popular option in alfresco design to help create an indoor-outdoor feeling, and help manage temperatures are insulated ceilings. So what does an insulated ceiling give you? The heat from our Australian sun can be overbearing, even when you’re sitting in the shade. Having an insulated ceiling is an instant way to reduce radiant heat transfer – in some instances by over 90%*. If you would like to know more detail on how, check out the technical details over the page, or give Phil a call to discuss, T 0260 406555. 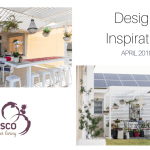 If you want your alfresco to feel like it is part of your home and create a natural flow from your indoor space to outdoors, having an insulated ceiling can help achieve that. Alfresco areas often use a vaulted ceiling, which creates a distinctive difference to your indoor rooms (unless they too have vaulted ceilings). 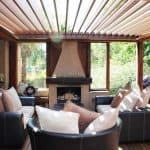 By adding an insulated ceiling that matches the same level as the room (or rooms) leading to your outdoor area, you immediately create a connection between the two. Want to know the technical details? At Ultimate Alfresco, we have been using Ceilink insulated ceiling panel system for a number of years. Below are some of the reasons. ∞ Their insulated panel system is quick and easy for us to install, which reduces your costs. ∞ The EPS insulated core of the system reduces radiant heat transfer by over 90%. ∞ The rigid insulated panels are Australian made with a pre-finished white steel ceiling face, insulated core and reflective foil backing. ∞ They have a Group 1 fire rating and great long-term thermal properties. ∞ The panels are 900mm wide and are available in a range of made-to-order lengths. ∞ The specially designed interlocking panels can be mounted under your existing roof, or included as part of your design process. ∞ They are low maintenance and don’t need painting. This means you get to spend more time in your alfresco area relaxing. 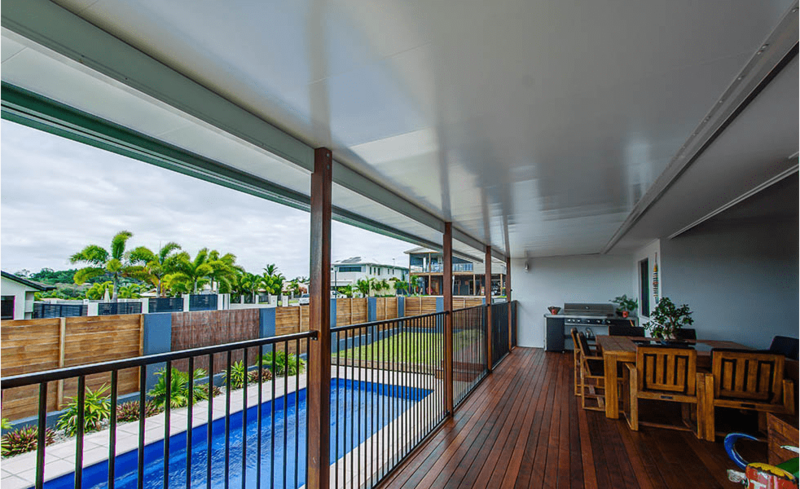 If you want to know more about the benefits of an insulated ceiling for your alfresco area, contact Ultimate Alfresco.